You can temporarily turn off the projected picture and sound if you want to redirect your audience's attention during a presentation. Any sound or video action continues to run, however, so you cannot resume projection at the point that you stopped it. If you want to display an image such as a company logo or picture when the presentation is stopped, you can set up this feature using the projector's menus. 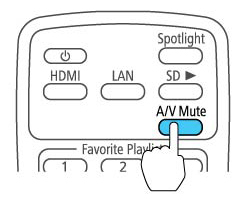 Press the A/V Mute button on the remote control to temporarily stop projection and mute any sound. To turn the picture and sound back on, press A/V Mute again.